When I attended the 2016 TCM Festival in Hollywood, this final film in the career of John Garfield was playing at the Egyptian Theater and was clearly marked on my dance card. It was for me the first and so far the only opportunity I’ve had to see a Garfield film on the BIG screen and aside from The Postman, this would have ranked high on the list if I was given a choice of titles to choose from. 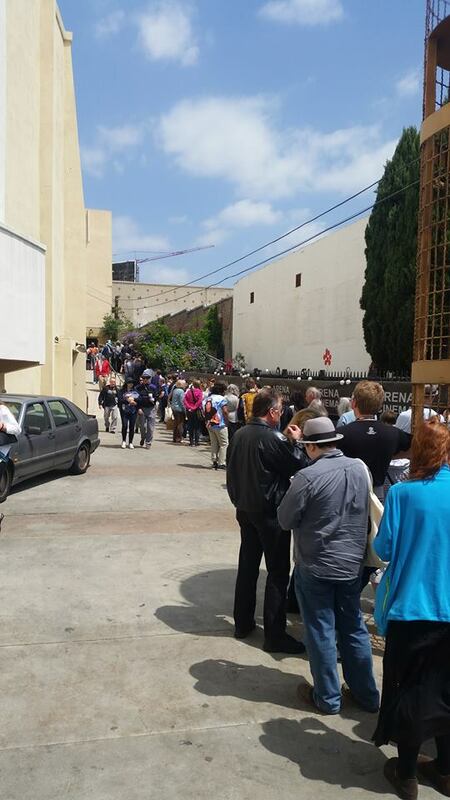 Apparently I wasn’t the only one excited to see John’s Noir classic at the Egyptian. The line up extended out to the back of the building on this sunny mid morning. 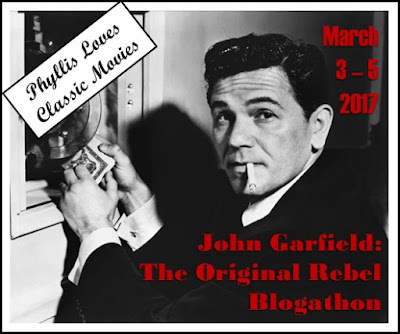 He Ran All the Way is my contribution to the John Garfield blogathon which has kindly been organized by Phyllis Loves Classic Movies. By the time Garfield growls these lines at Wallace Ford, his fate has already been sealed. The film from director John Berry wastes little time in setting up John as a tormented Noir character. He’s in a rundown apartment, it’s hot and he verbally abuses his Mother, “Go on. Knock off.” Emerging on the crowded city street dressed in black he meets up with fellow hood Norman Lloyd. They’ve got a heist to pull and within ten minutes from the opening credits, John’s killed a police officer in a bungled payroll robbery and his partner lays dead. Incredibly, when I attended the Egyptian Theater to see the film, a 101 year old Norman Lloyd was in attendance and took a bow to the enthusiastic applause. Mingling into the city crowds and on the run, John finds himself at a public swimming pool latching on to a young woman when he sees local police scanning the crowd of swimmers. He’ll stick to her for cover and find himself escorting her home. Cast as the female lead is Shelley Winters. Perhaps a little too excited at a man’s interest in her, she seems to overlook the edginess in John’s character. 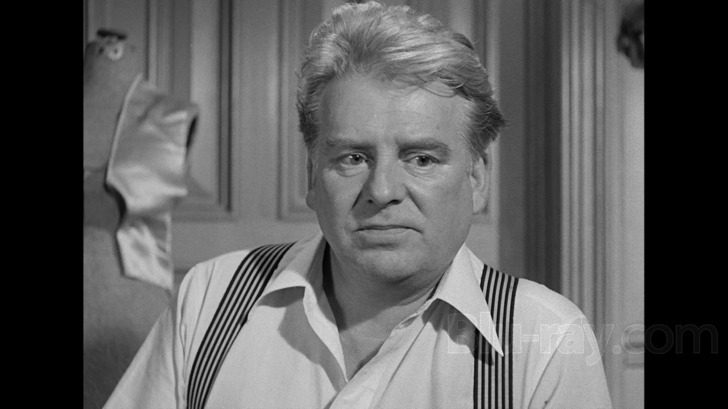 Once back to her families apartment, the plot will turn to a hostage situation with a battle of wills between Garfield’s killer and Wallace Ford’s wonderful turn as a working class head of the family. 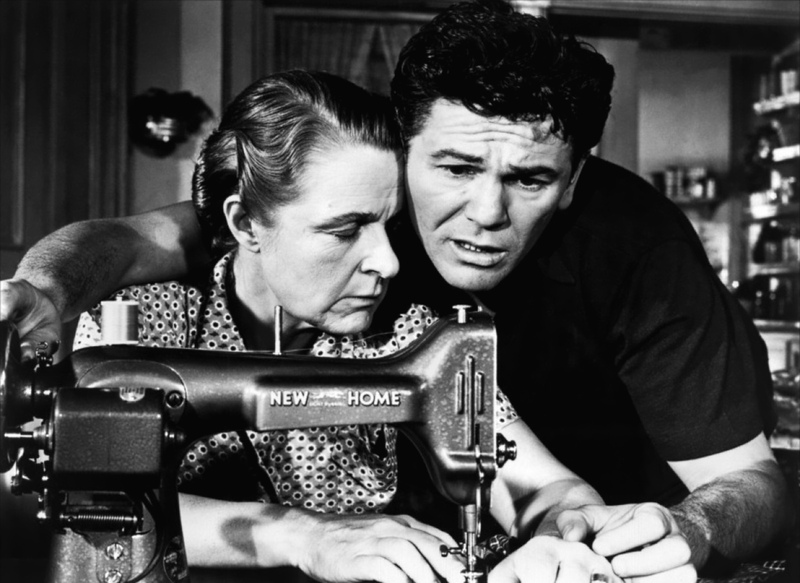 Rather than recite the plot, let’s focus on John Garfield and this terrific performance in what is sadly his final role at the age of 39. “I got big plans.” he’ll point out with ten grand in his pockets but his is a doomed character. A born loser who is nothing less than self destructive. His tough demeanor softens at various times as he tries to become a member of the family he holds captive. Along with Ford and Winters are Ford’s wife played by Selena Royle and Robert Hyatt as Winter’s little brother who can’t be much more than 10 years old. While Garfield plays it tough there are cracks in his exterior in multiple scenes. He supplies a turkey dinner for the family though they prefer the stew Mom has cooked. When Mother injures herself after Garfield goads her to distraction, he suddenly turns into caretaker and most notably when the young son attacks him, he lets the boy swing away until the boy succumbs to tears at which point Garfield gently cradles him to his chest. The actor deftly allows his character to offer us a window into what he realizes life has denied him. The finale to the film is both hair raising and harrowing made even more so when one is aware it’s Garfield’s final appearance on film. It’s fitting that this one was shot by the revered James Wong Howe from a script co-written by Dalton Trumbo no less. Special mention has to be directed to the magnificent turn from Wallace Ford here as a Father cornered and concerned for his family’s safety. 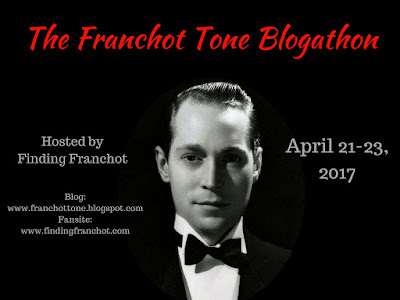 With well over 150 acting credits to his name, one might be hard pressed to find a better performance out of the aging character actor who appeared in films ranging from thirties classics like The Informer to Monogram’s The Ape Man. 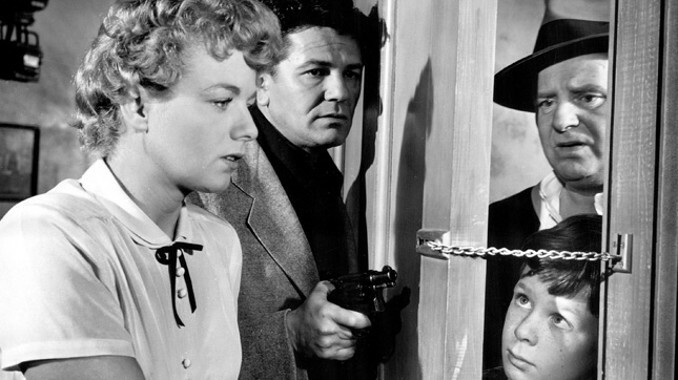 He would also appear with Garfield in another Noir favorite, The Breaking Point in 1950. Franz Waxman supplies us with a biting score that suits the genre while many of the camera angles from director Berry perfectly frame the confused Garfield at various points in the film. Like the heat of the hot summer the story takes place in, Garfield can often be seen simmering on camera until he explodes grabbing the viewer by the throat, demanding we watch his self destructive nature that leads to his undoing. Shelley Winters? The less said the better I guess. I often wonder if I’m too hard on her but if there’s a weak link in the film, I’d clearly point in her direction. Maybe her needy role hasn’t aged well but I couldn’t help but think to myself after this most recent viewing, she’s destined to be a battered wife and if she does indeed run off with the Garfield character, that’s the future that awaits her. No doubt. It’s not Winters that’s going to keep you riveted to the screen anyway. It’s the explosive John Garfield. 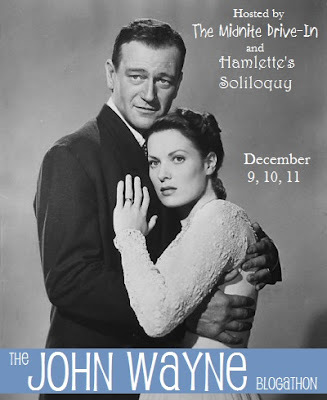 Who knows what roles may have come his way if things had worked out differently and John had lived another decade. A new era of stars were arriving in the fifties and a new style of actor with Brando. It’s the classic “what if”. It sure would have been memorable to see John on screen with the next class that were being signed on by the majors. Time to read more about John and the subjects other writers have chosen to share with one and all. 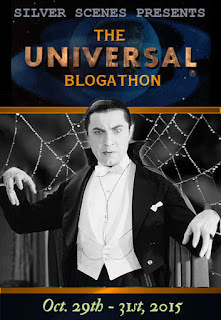 Give them a look to learn and discover more about this actor who somehow deserves a bit of that cult status that seems to have been reserved for Bogie, Cagney and Eddie G.
This guy’s done an awful lot of big-name movies, yet I’ve only seen one…’Force of Evil’, which I really liked. I’m going to have to check his other films out, including this one. And pretty cool about Lloyd being at that screening…to me he’ll always be the guy who falls from the Statue of Liberty in ‘Saboteur’. Just one! Check this one out and you’ll be addicted. Surprised you haven’t seen The Postman Always Rings Twice. Lloyd was in a ton of stuff I guess and not a guy I think of very often but it was a treat to see him that day. Has to be a weird feeling being over 100 and seeing yourself on the screen 60 years younger. Great post on a very interesting film from of the screen’s more interesting leads. I envy your seeing tis on the big screen, and in the company of Lloyd no less, and can only imagine what a thrill that must have been. On Winters, I’ll confess that I’ve never been a fan of that needy persona she so often projected. However, I recall someone telling me once that she admitted it wasn’t a choice she made herself, rather it was something suggested to her (don’t ask me by whom, a director or producer I guess) and then it kind of stuck and she was asked/expected to play up that aspect time and again. With Winters that probably is true. It was the studio era and once your cast in stone that’s it for many. She played this role repeatedly in films like The Big Knife etc. Garfield’s performance makes it easy to shift your focus from her to the strengths of the film. Nice take on Garfield’s swan song. It’s a sweaty and intense watch with excellent work by all, though I’d agree Shelley isn’t seen to her best advantage. Not sure if it was a conscious choice to suit the character or a sign of his incipient death but Garfield looks terribly haggard in this, he seems to have aged a shocking amount since The Breaking Point, my favorite of his films, only a few months before. His early death was a real loss to film. His style was always a mixture of naturalism and intensity which I think would have translated easily to what is considered more modern cinema. It’s not hard to imagine him as part of the cast of On the Waterfront, The Blackboard Jungle or any film with a gritty background though he was comfortable in the diamond in the rough mode of something like Humoresque. Nice that this corresponds with his birthday today. Our thoughts are clearly linked. I almost brought up On the Waterfront while putting this together as a film he could have slid into with that new crop of stars. I recently wrote a piece on The Breaking Point for the Noir newsletter The Dark Pages. I too am a fan of that one. Nice post on one of my favorites. He was such a good actor. Perhaps if he hadn’t died so young and had gotten the chance to make more movies and like you say, work with the new actors coming up, he would not have been so overlooked. And Norman Lloyd, what a great man of film. First with Welles in the Mercury Theater, and later with Hitchcock as actor and TV director. And how about being married 75 years to his one and only wife. I too love the screen persona of Garfield. One of those guys it’s hard to keep your eyes off. Lloyd sure has been around and 75 years!!! Wow. I enjoyed your article which is as riveting as the film. I was teenager back in the 70s and a local radio station was doing a call-in show on Oscar night. Folks were talking about their favourite movie stars. A lady said her all-time favourite was John Garfield. The D.J. responded that he’d never heard of him. Honestly, that cult following is well past due. Too kind. Every now and then I’ll randomly ask a coworker who is younger than me if they now who —— is. Usually get a no. I’d be shocked if any of the younger crowd at work knows who Garfield is. Sadly I have to add. Seeing this on the big screen at TCMFF was a thrill. 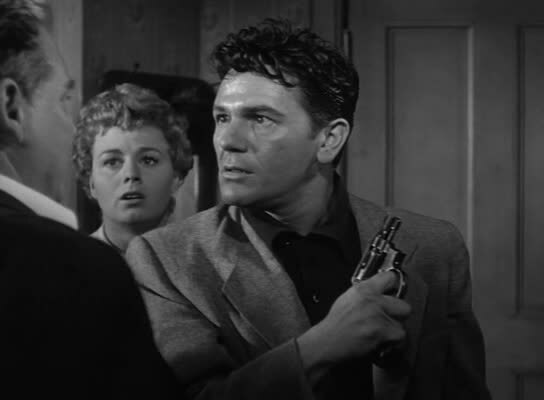 John Garfield’s performance here is everything you said it is. And it’s about time he received legendary cult status like Gable or Bogart. I’m glad you talked about Wallace Ford’s performance. He was superb, although his character was overshadowed by Garfield’s intensity. It was fun wasn’t it. He really deserves to be better known like a James Dean is in pop culture. Wally Ford was really a highlight here and maybe one of those guys we too often take for granted in lesser roles. He delivers a heck of a performance. Oh man! I would LOVE to see Garfield on the big screen! How lucky!! This is such a great write-up of Garfield’s last role. Explosive is the perfect word to describe his amazing performance. I personally also enjoyed Winters role, which led me to seek out more of her films. 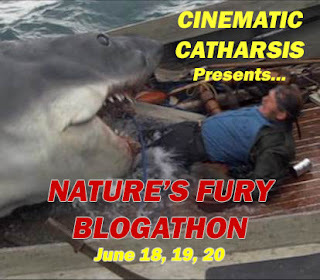 Thanks so much for participating in this blogathon with one of my favorites (of course, most of Garfield’s films are favorites…). Although it would have been wonderful to see where his career went in the following decades, I’m glad his final film was so memorable, rather than forgettable like so many other stars. Just wish I could see more classics on the big screen. Not just the ones we might expect every once in a while. At least not in my part of the world. My pleasure to join in. Thanks. At the risk of starting World War III, I must tell you that I do not find Garfield mesmeric. Bill Holden would have been the better choice for the part of Frank Chambers in: ‘The Postman Always Rings Twice’, and Farley Granger would have excelled as Nick Robey in: ‘He Ran All The Way’. I have never liked Shelley Winters, and I think Marie Wilson would have been the better choice for the part of Dixie Evans in: ‘The Big Knife’. That’s ok voicing your opinion out here. The one thing we do agree on is Shelley Winters. Recasting movies is fun so I have no problem with offering up alternatives. Ill have a look for the title you’ve suggested as well. Always looking for new to me flicks. ‘Miss Tatlock’s Millions’ (1948) is irresistibly funny (and might have been funnier still, had it been made in the ‘thirties). Here are the principal players: John Lund, Wanda Hendrix (as Miss Tatlock), Barry Fitzgerald, Monty Woolley, Robert Stack, Ilka Chase. Another film worth exploring – and that needs no re-casting, is: ‘Home Before Dark’ (1958). I love it. I do have a copy of Home Before Dark, I’ll have to get at it. Dude big respects getting to see it on the big screen and thanks for putting me to him. 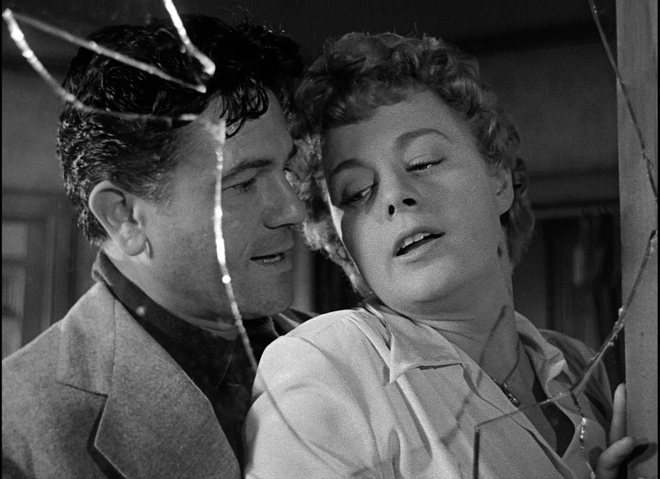 I’m the same with Shelley Winters, though I really liked her in this, that naive, innocent portrayal made the end so much more heartbreaking. That end is so tragic. Super write up sir and thanks again for recommends. Great film and yes it was cool to see it at the TCM fest in Hollywood with fellow Noir fans. Heartbreaking and loved Wally Ford as well in this as her father. What a loss knowing it’s John’s final flick. Glad you loved it!! !